The finicky, but really great of an idea Xbox Kinect game Disneyland Adventures came out a few years ago, and much to my surprise, was released in October for the XBOX ONE. Just like the original, you are there, in Disneyland walking around, interacting with characters (no lines! Walk on up!) and riding rides. The game is fantastic, and so much fun, because while some rides, like the teacups, you just ride in, others you control the ride! Help defeat Emperor Zurg! Launch the Fireworks above the castle! Go on missions to help out the different Cast Members and characters. It's fun for the whole family! We've enjoyed playing, and it's it's nice to be able to use a controller, not have to deal with the kinect, though that is an option still if that is how you'd like to play. You can choose a boy, or girl, pick from different outfits and hairstyles, even "buy" with in game earned money, costumes and accessories! The second player can drop in, or out but can only follow, not explore on their own. Enjoy a few screen shots! If you are interested in the game, it's ONLY $30! Can you believe that?! I like how they kept the original case art, too. We still have our 360 version, but it was near impossible to play! The change is fantastic, it was worth the preorder! 2018 Disney Rapid Refill Mugs - still Worth it? New year, new changes. That happens every where, Disney included. For 2018 there's been a slight change in the cost of the Disney Rapid Refill Mug. Is it still worth it? The price of the rapid Refills Mugs in 2017 was $17.99 for the length of your stay. 2018, it's $18.99. That's just a dollar, but... is it worth it? ​Lets start off with a review about what the Rapid Refill Mug is. Disney offers a really nice perk to those staying on Property. A souvenir mug that's not only solid quality but will stand up to many times in the dishwasher and many tumbles onto the floor without any fading, cracks or marks. Anyone staying at an on property resort can buy one of these refillable mugs, but those who purchased the Disney Dining Plan get to have the mug included at no extra cost. If you want to learn more about the Disney Dining Plan, click right here to read my post about it. The refillable Disney mug lets you fill up your mug as often as you want, with whatever you want in the food court area of your resort, or any other for the length of your stay. There is a RFID chip in the bottom of it, that allows the owner to fill it up. There is a small time delay between fill ups. If you tried to use a different cup, say a regular sports bottle without the RFID chip in it, the machine won't dispense the beverage. What can you fill it up with? Disney has Coke products, and you'll generally find the same things on tap that you would most any fast food place, Sprite, Coke, Diet Coke, Hi-C, lemonade, root beer, etc. You can also get tea from their tea machine, which usually has four different kinds available, sweetened, unsweetened, white citrus or green. If you like hot drinks, it's all you can drink hot tea, hot coffee or hot chocolate. You will not find juice or milk available to fill in the mug. There are also mug wash spots near the drink dispensers so if you want to fill your mug with orange soda, the last few drops from your morning coffee won't make it taste strange. The mug, and it's unlimited refills costs $18.99 for the length of your stay. Where can I fill this up at? At your resort, or any other Disney resort if you feel like carrying it around. You cannot fill it up within the Parks though. If you want to fill it up in the morning and drink it at the bus stop, be prepared to carry it with you until you get back to your room. Why is this right for me? Why should I skip this? Can I have an example of the savings if I bought this? If the average person bought only three drinks a day, let's say a morning coffee ($2.79), an afternoon soda ($3.29) and an evening tea ($3.29), based on food court prices it would come to $9.37. On a 3 day stay that equals $28.11. The mug is more than paid for, and it's cheaper to have the drinks, plus the mug to take home as a run reminder of your vacation. I'm on the fence as to if I should get this. In our opinion, it's completely worth it for the mug since just three drinks in it a day and it's paid for by day two, but I know there are people who don't drink anything other than water, so you'll need to figure out what works best for you. There is always the option of just buying one or two mugs for a family, if some are soda/tea/coffee drinkers and some are not, and sharing. What about you? Have you ever gotten the Refillable Mugs before? Do you like them or is it not a good buy for your family? This year's Advent Calendars are a little different! They have regular ones, sent from their Grandmother in Texas, but we also stumbled across these Star Wars ones at Target. There were a few different designs, and they were $3.50 each, a little more than a regular advent calendar, but they were Star Wars! Every day's chocolates are the same, it says Star Wars, though there are two different shapes, oval (shown below) and rectangular, more of the classic look, which at first made the boys sad, but I'm thinking after Christmas I'll save the candy mold, so that I can reuse them (maybe?) to make my own Star Wars chocolates, or mold candy melts for cupcakes in the future. Makes me want to find some Disney ones now, too! Disney Road Trip Box Surprise! A while back on Facebook, I mentioned how I had wanted to make a surprise gift for my boss and his family (also dear friends of ours) who are going to Disney World for the FIRST TIME with their 5 kids, ages 8-15. I wanted to make it FABULOUS but also, in keeping in line with my philosophy, do the Magic on the Budget, and I think it worked out really, really great! A huge bag of glowsticks -- this bad has glow everything! Sticks, bracelets, rings, etc. It's only $5 at Target, and it's an awesome buy. There's 50 different glowsticks if I remember right! We've used this brand several times and one pack lasts us a while, I figure this will last them the week! ​I had really wanted to get them a Disney DVD, but I wasn't sure if they had a DVD player in their car, plus, I didn't want to ask, because I didn't want to give away what I was doing. From the start I knew I wanted it wrapped in red and white polka dot paper. They might not get the Minnie Mouse reference, but once they get down there I bet they will!! It was harder than I imagined to find a box I could wrap entirely, with a huge white bow, so I wrapped the side of the box, folded in the flaps, and went with tissue paper for the top. It actually turned out really well and there's no accidentally opening it upside down. It is a little more foody that I might usually do, but since they are starting out after a full day's work, snacks would be good I thought, plus, consumables don't take up much space for long! Hopefully they enjoy the surprise, but I'm also hoping they fall in love with Disney as much as so many of us have! Do you want a few more road trip ideas? Click here for Staying Sane on your Roadtrip! Whew. It's been crazy around here at my house, what about yours? In just the last week we've had 2 Christmas parties, a Christmas dinner, 3 kids holiday performances, multiple school events, an injured foot not getting better (mine) someone with the start of another sinus infection I bet (mr Disney Magic) and a nerf bullet to the eye (also me) resulting in so damange, thank goodness, but tons of pain! That's on top of work, school, gifts to wrap, meals to plan...AAHHH!! I'm a week behind here! But I'll be catching back up ASAP! 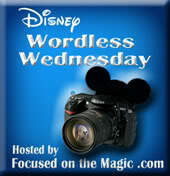 So this week's theme at Focused on the Magic is .....Disney Magic!! My favorite topic! (Sorry everyone at the work Christmas Dinner if you heard too much Disney talk. I tried to reign it in... honest! But my boss and his family are going FOR THE FIRST TIME EVER!! So excited for them! My picture is of our mantle. It's just a little touch of Disney, but it makes me smile each time I see it! Want to see more (and better! I used my phone, which doesn't take the best shots) Disney magic photos? Click here to see what everyone else is posting this week!